Murder. Cannibalism. War. Treachery. 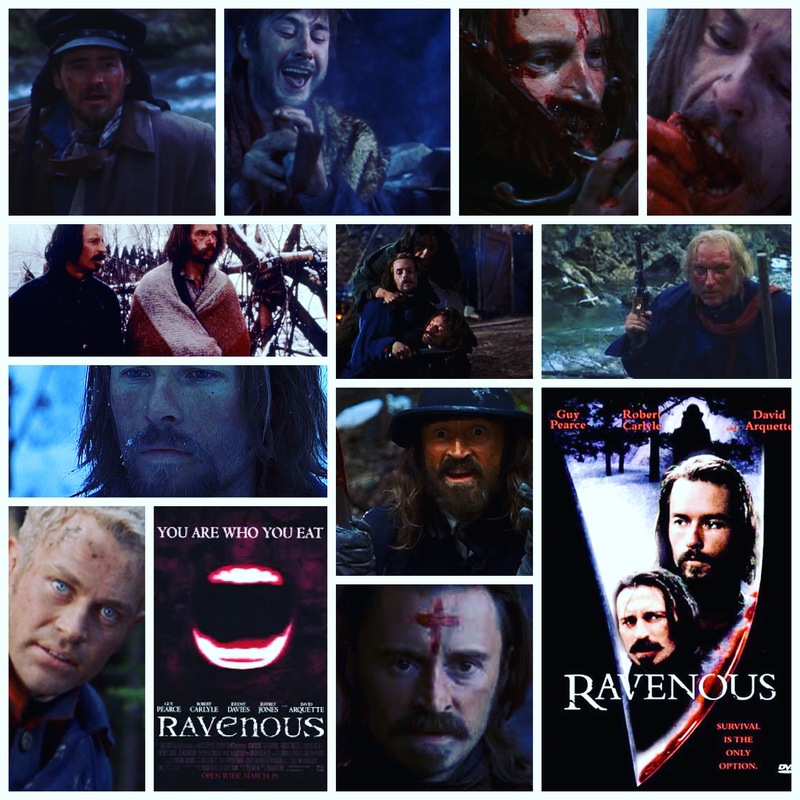 You wouldn’t think that such subject matters would make for any sort of lighthearted film, but Antonia Bird’s Ravenous somehow manages it, becoming a classic in my canon along the way. Despite the dark events that unfold, it’s become somewhat of a comfort film for me, one I can put on any old time for a rewatch and enjoy the hell out of. It’s amusingly disturbing, lively, cheerfully gruesome, well casted, oh so darkly comedic and has wit for days. Guy Pearce plays Boyd, a timid soldier who’s banished to a remote fort in the Sierra Nevada Mountains after a prolific display of cowardice during the Mexican American war. His superior officer (crusty John Spencer) just wants him out of his sight, and Boyd just wants to survive and forget the horror he endured in combat. Even worse nightmares are just around the corner though, when mysterious drifter Calhoun (Robert Carlyle in Charlie Manson mode) shows up at the encampment and all sorts of depraved shenanigans kick into high gear. Calhoun turns out to be a serial killing, cannibalizing, grade-A certifiable madman, and no one in their company is safe from that moment forward. Jeffrey Jones is a jovial scene stealer as the fort’s commander, getting all the best quips and quirks. David Arquette howls his way through a barely coherent performance as the resident peyote hound, and further colour is added by weirdo Jeremy Davies, Sheila Tousey, Joseph Runningfox and Neal McDonough as the tough guy soldier who discovers he ain’t such a tough guy after all. Again, as dark as this film gets, it never loses it’s sunny, demented disposition. This is largely thanks to one bouncy melody of a score from “, ditching any portentous strains or eerie chords for a purely arcade style, quite pretty lilt that’s catchy, silly, warped and probably the most memorable aspect of the piece. Pearce plays it introverted, keeping his fear close to the chest and using it when desperation creeps in, or whenever there’s a hair raising encounter with Calhoun’s monster. Carlyle is a caffeinated blast in what has to be the most fun type of character to play this side of Freddy Krueger, an energetic goofball psychopath with a lovable side that he jarringly switches off on a whim in favour of his leering demon persona. The gorgeous Sierras provide stunning photography for this peculiar fable to play out in, a perfectly evocative backdrop for a campfire tale of murder and, I should mention, pseudo vampirism. There’s a supernatural element to the consumption of human flesh that runs alongside the vampire mythos, putting a neat little spin on an ages old concept. There’s nothing quite like this film, in the best way possible. Leaking wicked sharp atmosphere and knowingly deadpan performances, while retaining the spooky, blood soaked edge of a great horror film. One of my favourites.